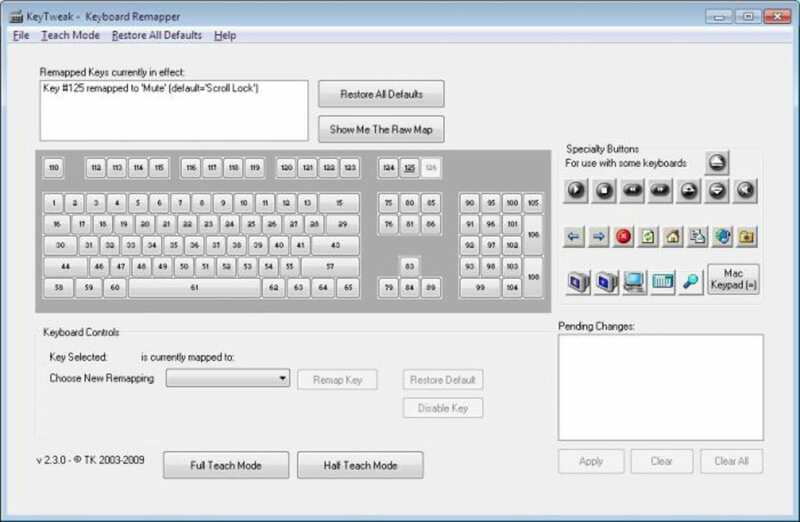 The Keytweak program allows you to remap your keyboard keys: you are able to reset all your mapping with just one click you may disable keys enable others and save your redefinition within just a few clicks. When you open the Keytweak GUI you will see your keyboard along with a series of commands and buttons. Define each key as you wish and set it alongside a command or leave it blank to disable it. Once you have finished mapping your keys save your work and enable the Keytweak program. From that point onwards your keyboard is mapped as you defined while using the program's GUI. There are plenty of reasons why you may wish to redefine your keyboard. It may be a security measure or you may need to redefine it to run a program you have or to play a certain game. The Keytweak system will even help you if your keyboard is broken and some of the keys no longer work. It is a free program that works brilliantly so if you need your keyboard remapping you need look no further than this program. Horrible piece of junk. It is an old horrible piece of junk. It can only do some childish stuff. You cannot change the $ key, because the junk only understands 4. It doesn't understand SHIFT+key. It's 2009 anyway! Doesn't understand your need to change a SHIFT+key. Thank you so so much for quickly & easily solving my Lenovo keyboard issue!. This program is so easy and effective. I had my Lenovo ideapad 510 keyboard issue solved in under 4 minutes! So easy to switch the pgup and the right shift. What a serious design flaw in an otherwise good computer. Thanks to this program I did not throw the computer in frustration. Thank you so so much!!!! Easy to use program to design your own keyboard. This is exactly what I wanted. I only wanted to switch out a few keys on my keyboard, and this program is simply perfect for my needs. The program is easy to use, even for a non-techie person like myself. So happy to find this.